Nature Matters Ambassadors are people who represent the values and commitment of the Nature Matters Community to get kids outdoors and engaged with nature. 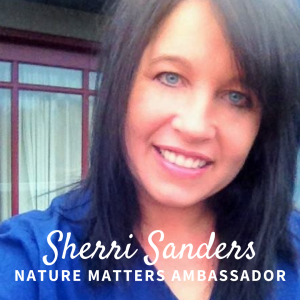 Sherri Sanders is our very first Nature Matters Ambassador to feature! You are going to be in awe of what she is able to accomplish in a single nature-filled day with her preschoolers. Sherri is the owner and founder of the Wild Child Outdoor Preschool located in Kalispell, Montana. Wild Child is a nature-based, facility-free, mobile preschool that combines early childhood education with environmental education to develop a child’s lifelong connection with the natural world. They are outside, all day, every day (with the exception of really bad weather). She works with her daughter and they serve 15 children at a time. Sherri has been running her preschool for 28 years and has served over 100 children in a location where it snows 6 months out of the year. I don’t know about you, but I’m feeling inspired and motivated by her work! Check our her preschool’s facebook page here! Or her instagram account here! Warning: if you open this page, you’re not going to be able to close it. I honestly can’t get enough of these kids and their adventures! Now, I’d like to address all the questions I know you’re asking. Why do I know you’re asking them? Because I asked them myself. What is a mobile preschool? It can’t seriously be facility free!? I was so blown away by this idea that I can to ask Sherri for clarification. Twice. They meet parents at a designated spot every morning to load the kiddos into the Wild Child school bus. They spend the day at a pre-planned outdoor space where their classroom, lunchroom, art room, nap room, yoga class, recess, kitchen and playground are all provided by the great outdoors. At the end of the day the kids are loaded back into the bus and they drive to a designated spot for pick up. On days when the weather is too cold, they visit museums, libraries, local businesses, or take a fun class together. Are the parents worried about their kids being outside all day long? Nope. Not at all! This is primarily because the people who choose Sherri’s preschool are like-minded in their educational philosophies and the value they place on nature experiences. However, if parents did have concerns, Sherri posts photos and videos of the kid’s adventures so parents can see that their children are having fun and learning while safely playing in the great outdoors. For those of you thinking about how cold Montana is, remember that cold weather can’t make you sick. And Sherri is a great testament to that because she spends every day outside with small children and rarely gets sick. What are the kids learning outside? Sherr’s preschool curriculum infuses a child’s connection to nature with self awareness, confidence, physical and mental health, teamwork, life skills, independence, imaginative growth, the importance of trial and error, and a love of all things living. They focus on managing the child’s emotions first, so they can learn pro-social behaviors, manners, and integrity. Her students learn all the academics they need to know to start kindergarten, and much of the information is learned in 5 languages (English, Spanish, German, French and sign language). They also coach each student to identify their personal strengths and weaknesses, to accept each and to manage both. Their comprehensive, nature-based curriculum helps students understand that learning is a life-long process and that they can thrive in any situation. What are people’s first impressions of the school? Focus on questions, not answers. Sherri made an excellent point! When we’re outside with our kids, we should try to focus on developing questions rather than generating answers. This applies to kids as well as parents. If you’re overwhelmed about getting outside because you don’t know any of the plants, animals, or systems, don’t worry! You don’t have to! Science is all about discovery, and the way you discover something new is to ask a question about it. So the next time you get outside with your kids, don’t worry about learning something specific about nature, just observe and start asking questions. I’m actually a Project WILD Facilitator and curious about other ways to persuade teachers to get their students outside. Learning is best when done outdoors. Hi Michelle, this is a great question! Based on the research and just talking with teachers, I’ve heard many of them talk about time, not knowing what to do outside, activities that fit their learning objectives (which I know most organizations work to elminate this problem by matching standards with the activity’s outcomes), weather, and safety/hazards. But, let me talk with one of my teacher friends and see if I can get an answer that reflects her concerns and barriers. I’ll focus on this topic for a blog post soon and will reply to you when I have it posted!